New Delhi: Interim Budget 2019-20 was presented in Parliament today by the Union Minister for Finance, Corporate Affairs, Railways & Coal Piyush Goyal. Besides having a major Scheme for the farmers, the interim Budget provides tax sops and sets the Developmental Agenda for the years to come. 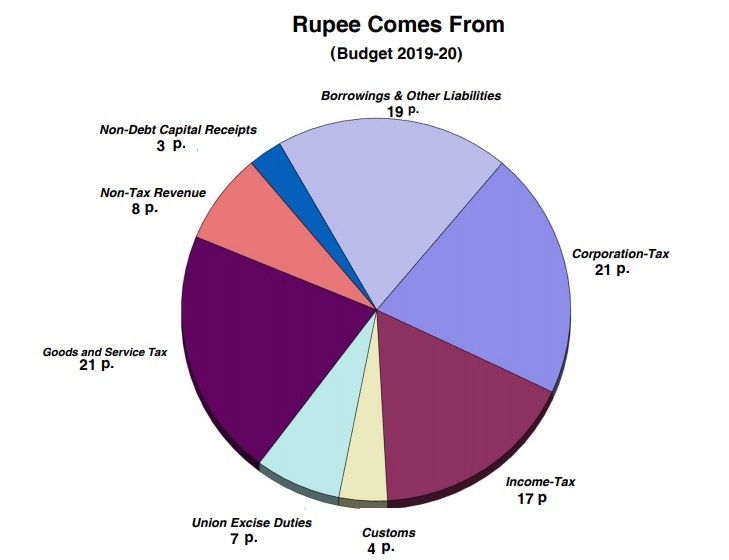 In RE (revised estimate) 2018-19, the total expenditure has been kept at Rs. 24,57,235 crore and is more than BE (Before estimate) 2018-19 by Rs. 15,022 crore. The increase in total expenditure is on account of increased support to agricultural sector, interest payments and internal security. The total resources going to States including the devolution of State’s share in taxes, Grants/Loans, and releases under Centrally Sponsored Schemes in BE (2019-20) is Rs.13,70,620 crore, with a jump of Rs.1,24,036 crore over RE (2018-19) and Rs. 2,85,492 crore more than the Actuals (2017-18). There has been a slight decrease in Gross Tax Revenue estimates for 2018-19 to the tune of about Rs.23,067 crore mainly on account of lesser than anticipated collection of GST. Indirect tax was budgeted at Rs.11,16,000 crore for 2018-19. This estimate has been revised to Rs.10,42,833 crore which is a decrease of Rs.73,167 crore from BE level. Direct tax estimate has been calculated to be Rs.12,00,000 crore in RE, which is an increase of Rs.50,000 over its budgeted amount of Rs.11,50,000 crore. This will help in mitigating the anticipated shortfall in GST to some extent. 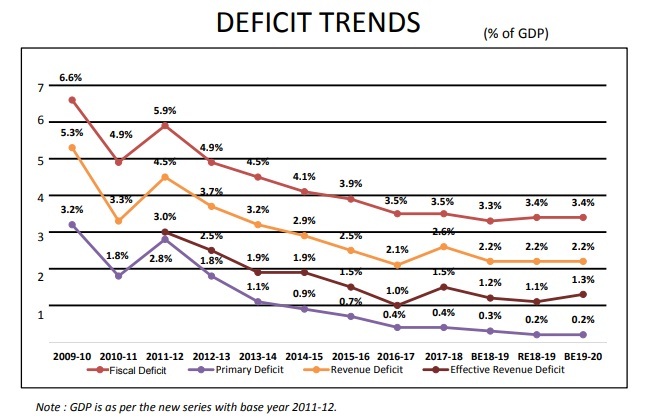 Primary Deficit is another indicator which has been included in the Medium term fiscal policy statement from 2019-20. Primary deficit refers to the deficit left after subtracting interest payments from fiscal deficit. 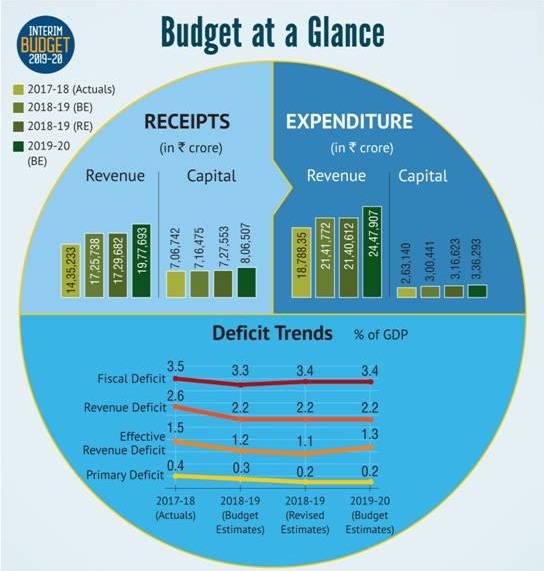 In BE 2018-19, primary deficit was calculated to be Rs.48,481 crore which is 0.3 per cent of GDP. Primary deficit in RE 2018-19 is expected to be Rs.46,828 crore which works out to be 0.2 per cent of the GDP. The reduction of primary deficit is a positive sign as it shows reduced usage of borrowed funds to pay for existing liabilities. THE INTERIM BUDGET IS TO BE VIEWED AS A MEDIUM FOR A PROGRESSIVE PATH FOR THE COUNTRY. GOVERNMENT HAS BROUGHT DOWN AVERAGE INFLATION TO 4.6%, LOWER THAN THE INFLATION DURING THE TENURE OF ANY OTHER PREVIOUS GOVERNMENT. Goyal said that soon, businesses comprising over 90% of GST payers will be allowed to file quarterly return. The fiscal deficit has been brought down to 3.4% in 2018-19 RE from the high of almost 6% seven years ago, the Finance Minister mentioned. He said, the Current Account Deficit (CAD), against a high of 5.6% six years ago, is likely to be only 2.5% of GDP this year. “We contained the fiscal deficit notwithstanding the Finance Commission’s recommendations increasing the share of the States from 32% to 42% in central taxes, which we accepted in the true spirit of cooperative federalism, thereby transferring significantly higher amounts to the States”, Goyal said. Goyal said that due to such a stable and predictable regulatory regime, growing economy and strong fundamentals, India could attract massive amount of as much as $239 billion of Foreign Direct Investment (FDI) during the last 5 years, when most of the FDI was allowed to come in through the automatic route. 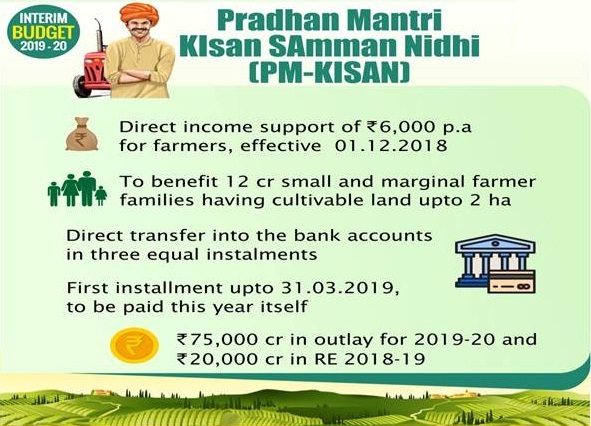 Pradhan Mantri Gram Sadak Yojana (PMGSY) is being allocated Rs.19,000 crore in BE 2019-20 as against Rs.15,500 crore in RE 2018-19. During the period 2014-18, a total number of 1.53 crore houses have been built under the Pradhan Mantri Awas Yojana, Goyal announced. Goyal also said that 14 of the 21 AIIMS operating or being established in the country presently have been announced since 2014. He also announced setting up of a new – the 22nd AIIMS in Haryana. Goyal said under the Ujjwala Yojana aiming delivery of 8 crore free LPG connections, more than 6 crore connections have already been given and the remaining will get free gas connections by next year. Finance Minister Piyush Goyal pointed-out that domestic air traffic passengers have doubled during the last five years, leading to large number of jobs also being created. The number of operational airports has crossed 100 with the commissioning of the Pakyong airport in Sikkim. Arunachal Pradesh came on the air map recently and Meghalaya, Tripura and Mizoram have come on India’s rail map for the first time. India’s installed solar generation capacity has grown over ten times in last five years. Stating this, Goyal said that “our commitment to promote renewable energy is reflected in setting up the International Solar Alliance, the first treaty based international inter-governmental organisation headquartered in India. This sector is now creating lakhs of new age jobs, the Minister added. Goyal said that he is proposing, through the Finance Bill, necessary amendments to levy Stamp duties on one instrument relating to one transaction and get collected at one place through the Stock Exchanges. The duty so collected will be shared with the State Governments seamlessly on the basis of domicile of buying client, he said.